cpe_foundation test deployment of Bionic failed. After some investigation, it looks like the nodes deployed and installed bionic, but never came back from a reboot. I experience the same issue in non-MAAS deployed machines after upgrading to the latest kernel. AS such, I'm marking this as invalid for MAAS and opening a task for the kernel. This bug is a kernel panic when rebooting at the end of a MAAS deployment of bionic; there is no way to run apport-collect. We can no longer reproduce this. We reproduced it again... looking to try the testing now. So far we've only been able to produce this by doing bionic deploys. It's possible that the message is related, but it would be difficult to track down without shortening the number of commits to search through between 4.4 and 4.15. It sounds like you can't reproduce this error with Artful and 4.13 based kernels. Is that correct? After updating firmware on the servers, we can't reproduce it at all anymore. We need to continue to investigate this issue as anyone upgrading a certified hardware with older firware will be stuck. This will be a bad user experience. Possibly a reproduction but in this case Xenial is deployed and rsyslog shows the kernel upgraded to 4.4.0-119-generic. 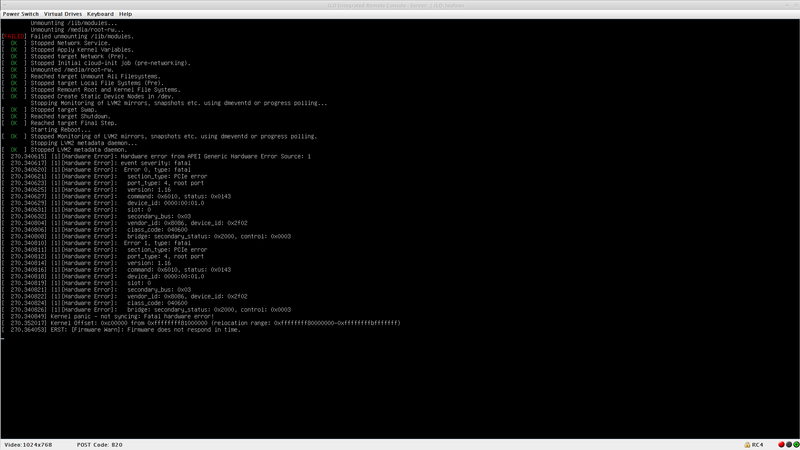 These are automated runs and we don't have the console output to confirm a kernel panic.